Magic House Sweden AB is a Swedish beverage company. 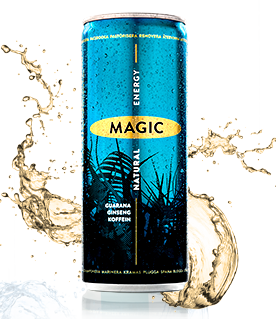 We started our business in the 1990’s, launching all natural energy drinks. We have since then evolved into a functional beverages company with a growing portfolio of excellent products. On the trendy, urban south side of Stockholm you’ll find the home of Magic House and our team of talented professionals. Our organization is built for speed and flexibility, to meet the demands of a constantly changing beverage market. We work with a preferred network of partners in communication, design, production and logistics. Having been a business partner of Magic House for several years, Al Sayer Group from Kuwait could see the potential of the company and acquired it in 2008 to support its ongoing international expansion Of Magic Brand. Our passion is functional drinks. Magic House is singularly focused on developing and marketing our attractive beverage brands, in collaboration with distribution partners, on international markets. Our vision is to be recognized worldwide as an innovative beverage developer & producer of unique and high quality functional drinks not only for the needs today, but also for the needs tomorrow.